We conduct studies in neurological patients who have focal brain lesions. For the most part, these are patients associated with the Cognitive Neuroscience Lesion Patient Registry at the University of Iowa, where we collaborate with Dr. Daniel Tranel. This resource was established by Antonio Damasio and Hanna Damasio originally. We study primarily adults with chronic, focal lesions, giving us unique insights into the necessary role of specific brain structures in specific cognitive processes. Our current work is focused on three themes. In collaboration with Daniel Tranel at the University of Iowa, Justin Feinstein at the Laureate Institute in Oklahoma, and Rene Hurlemann at the University of Bonn, we have been studied very rare patients who have selective bilateral amygdala lesions due to Urbach-Wiethe Disease. 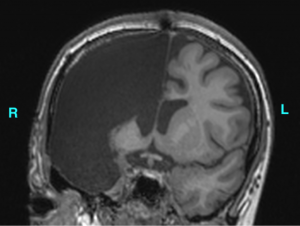 This is a genetic disease giving rise to developmental amygdala lesions in some patients. One of the largest groups of these patients is currently being studied by Jack van Honk in South Africa. Our work here has shown that the amygdala is involved in the experience of fear, and in the recognition of fear from facial expressions. 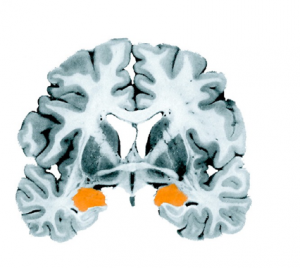 Image on the right: The amygdala is outlined in orange on this photograph of a coronal section of a post-mortem human brain. Image on left: MRI scans of the brain of patient S.M., showing the amygdala lesions. The section numbers (A,B,C) correspond to the planes indicated on the whole brain image shown in the upper left. The lesion can be appreciated in section C. by comparison to the intact orange amygdala on the left, and can also be seen as two symmetrical “holes” in section A.
Amygdala lesions impair the use of information from the eye region of faces. In our 2005 Nature paper, we showed that patient S.M.’s impaired fear recognition could be traced to an inability to make use of visual information from the eyes in faces. To show this, we used a method called “bubbles” invented by Frederic Gosselin and Philippe Schyns. The images shown here depict the visual information that viewers make use of in order to classify fear in faces. Another goal in our lab is to make comparisons across clinical populations, and across techniques. Shown here are eyetracking data to faces comparing amygdala lesions to autism: the hotter colors indicate that people fixate these regions the most. Left: Healthy controls. Middle: patient S.M. Right: people with high-functioning autism. Classic work by the group at the University of Iowa (Antonio Damasio, Hanna Damasio, Daniel Tranel) and others had shown that lesions of the ventromedial prefrontal cortex gave rise to severe deficits in social behavior and decision-making. Our work extended these studies to the realm of moral judgment, and to neuroeconomic quantifications of the decision-making impairment. These studies continue to provide a powerful complement to fMRI studies of the prefrontal cortex, and are still ongoing in collaboration with Daniel Tranel and John O’Doherty. Finally, in addition to focusing on the specific neuroanatomical regions implicated in emotion and social cognition (amygdala, and ventromedial prefrontal cortex), we have taken a more whole-brain approach and studied larger samples of patients with lesions distributed all over the brain. Our earlier work did this in a rather crude way, generating overlap images of lesions. Later, we used nonparametric voxel-based lesion-symptom mapping, which generates voxelwise statistics. These studies have revealed more distributed neural systems that contribute to cognitive processes like emotion recognition, decision-making, and intelligence. This work is ongoing, with collaborators Daniel Tranel at the University of Iowa, and Jan Glaescher at the University of Hamburg. Left: Lesion overlaps in patients from the Iowa patient registry. In these images the color encodes the density of lesion overlaps in 250 patients. Note that most of the brain is sampled, but not homogeneously, resulting in a complex anatomical distribution of statistical power to detect potential deficits. Perhaps there is no more remarkable example of brain plasticity and human adaptation than hemispherectomy. Hemispherectomy, surgical removal (or disconnection) of an entire cortical hemisphere, is conducted to treat severe epilepsy. It is a radical procedure, that is typically deemed ‘successful’ if seizures cease. However, very little is known about how the neural system adapts to this change, nor about the long-term impact of this procedure on cognitive and social functioning. In collaboration with Warren Brown at Travis Research Institute, Fuller Graduate School of Psychology, we are conducting an in-depth examination of cognitive, behavioral and neural functioning in adults who had hemispherectomy during childhood. Enroll in our Online Study: If you are 18 or older and have had a hemispherectomy, you may be able to participate in our online study. This study involves completing several questionnaires about your current behaviors and your medical history. You will also be asked to provide contact information for someone who can describe your current behaviors and/or history. If you are interested in enrolling, please contact lkpaul@hss.caltech.edu for more information. This work has been supported by the Brain Recovery Project (http://www.brainrecoveryproject.org/). Harrison, R. Hurlemann, R. Adolphs (2015). An enhanced default approach bias following human amygdala lesions. Psychological Science, 26, 1543-1555. Feinstein, J. S., Adolphs, R., Damasio, A., & Tranell, D. (2011). The human amygdala and the induction and experience of fear. Single-neuron responses to emotional visual stimuli recorded in human ventral prefrontal cortex. Nature Neuroscience, 4(1), 15-16.